Watch year: 2010. All images shown are of the actual watch. STAINLESS STEEL CASE WITH A STAINLESS STEEL BRACELET. BI-DIRECTIONAL ROTATING STAINLESS STEEL BEZEL. TUNGSTEN GRAY DIAL WITH LUMINOUS HANDS AND INDEX HOUR MARKERS. ARABIC NUMERAL APPEARS AT THE 12 O’CLOCK POSITION. MINUTE MARKERS. SLIDE RULE MARKINGS AROUND THE OUTER RIM. DIAL TYPE: ANALOG. LUMINESCENT HANDS AND MARKERS. DATE DISPLAY BETWEEN 4 AND 5 O’CLOCK POSITIONS. CHRONOGRAPH – THREE SUB-DIALS DISPLAYING: 60 SECOND, 30 MINUTE AND 12 HOUR. AUTOMATIC MOVEMENT WITH A 42 HOUR POWER RESERVE. SCRATCH RESISTANT SAPPHIRE CRYSTAL. SCREW LOCKED CROWN – TWO GASKETS. SOLID CASE BACK. CASE DIAMETER: 46 MM. CASE THICKNESS: 15.95 MM. ROUND CASE SHAPE. BAND WIDTH: 20 MM / 24 MM. DEPLOYMENT CLASP. WATER RESISTANT AT 200 METERS / 660 FEET. FUNCTIONS: CHRONOGRAPH, SLIDE RULE, DATE, HOUR, MINUTE, SECOND. LUXURY WATCH STYLE. WATCH LABEL: SWISS MADE. ADDITIONAL INFORMATION: SLIDE RULE” AKA “NAVIGATION COMPUTER” WHICH ALLOWS TO COMPUTE DIFFERENT AIRBORNE CALCULATIONS SUCH AS FUEL CONSUMPTION, CLIMBING TIMES & CONVERTING MILES INTO NAUTICAL MILES OR KILOMETERS. 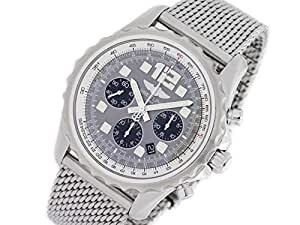 BREITLING CHRONOSPACE AUTOMATIC CHRONOGRAPH TUNGSTEN GRAY DIAL STAINLESS STEEL MEN’S WATCH A2336035-F555. COMES WITH GIFT BOX AND 2 YEAR PWJ STORE WARRANTY. *PLEASE NOTE THAT THE PRODUCTION YEAR OF THE LISTED WATCH IS AN ESTIMATION ONLY*. BUY WITH CONFIDENCE KNOWING EACH TIMEPIECE GOES THROUGH THE SAME RIGOROUS 31-POINT INSPECTION. REST ASSURED ONLY AUTHENTIC PARTS STRAIGHT FROM THE MANUFACTURER ARE USED. THE CERTIFIED PRE-OWNED PROGRAM ON AMAZON ENSURES PEACE OF MIND AND TRANSPARENCY VIA STANDARDIZED REPORTS AND A 1 YEAR WARRANTY PROVIDED BY WATCHFACTS.